DISEASES OF PROSPERITY We think we can barely keep up with progress. It’s nothing compared to what the Victorians had to deal with during the Industrial Revolution. They too had burn-outs, but they knew better how to cope with it. The renowned British physician Sir James Crichton Browne was, in 1860, concerned about the increased speed of thinking and acting that the modern age demanded. “Over the course of one month, our brains must process more information than our grandfathers had to in a few years of their lives,” he observed in a speech to the British Medical Society. This, he warned, would cause great stress to the brain. “How extraordinary,” thought literary historian Sally Shuttleworth to herself when she first read this speech. Incredible to her was the resemblance to our own time, when we are frequently being warned that a constant stream of external stimuli is deteriorating our ability to concentrate, and that we are overloading our brains with constant multi-tasking, tweeting, and typing. The advent of the internet, self-driving cars, smart phones and robots are challenges of our own time, but how did our ancestors respond when they were faced with a dizzying array of inventions, such as the telegraph, the railway, the steam engine, and electricity? Professor Shuttleworth, a slender woman in a sleeveless floral dress, wanted to find out. This question lead to a unique five-year research project at Oxford University on the various diseases that were attributed to the advent of the modernity in the Victorian age (roughly the second half of the nineteenth century, a time which saw the peak of the Industrial Revolution). From nervous weakness and stress to railway spine (damage to the back during a jolting train ride), bronchitis, and sleeplessness, it seemed that novelty and progress was making people ill, weak and burned out. With a team of three researchers, Shuttleworth is studying how the Victorians reacted to the unprecedented technological and social progress of the nineteenth century in order to learn about the problems we face in our own century. 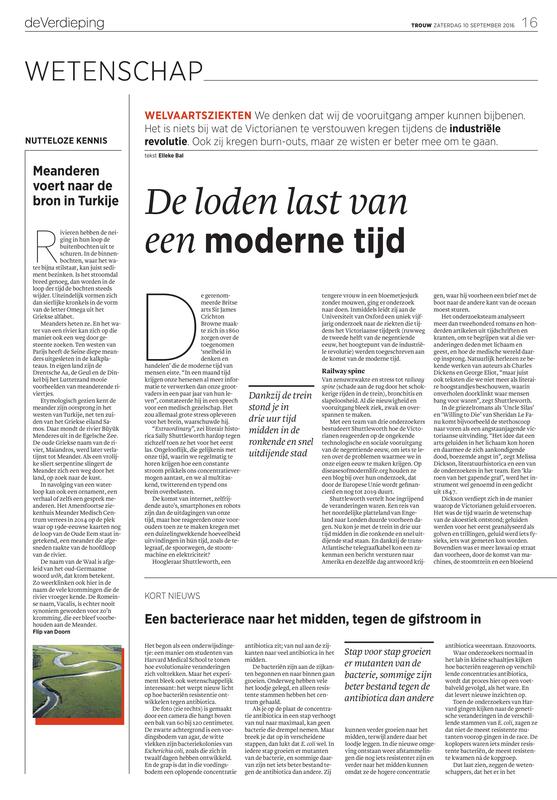 On diseasesofmodernlife.org they keep a blog about their research, which is financed by the European Research Council until early 2019. Shuttleworth describes just how profound these changes were. Earlier, for example, to travel from the northern countryside of England to London would take days, but suddenly you could travel by train and within three hours and stand in the middle of a noisy, rapidly expanding metropolis. And thanks to the transatlantic telegraph cable, businessmen could send messages to America and get a response within the same day, whereas before letters had to be carried across the ocean by boat. The research team is analysing more than 200 novels and hundreds of articles from magazines and newspapers in order to understand what all these changes did to the body and mind, and how the medical world reacted to it all. They are, of course, re-reading canonical works of writers such as Charles Dickens and George Eliot, they are also considering ‘many texts that would not be considered literary landmarks but that nonetheless give indications of what people of the time were afraid of’, says Shuttleworth. In gothic tales such as Uncle Silas and Willing to Die by Sheridan Le Fanu, for example, the stethoscope appears as a frightening new invention. ‘The idea that a doctor could hear sounds in the body and interpret them as an announcement of death spread fear’, says Melissa Dickson, a literary historian and one of the researchers in the team. The stethoscope was even referred to as a heraldic trumpet and an augur of death in a poem of 1847. Dickson is looking into the ways in which Victorians experienced sound. It was a time when the science of acoustics was being developed and expanded, and sounds were being analysed as waves and vibrations. Sound became something physical, something that could be measured. Furthermore, there was more noise in the street than there used to be, due to the advent of machines like steam engines, and a thriving urban life. Many people suffered from this, says Dickson, and it contributed to the idea that the human brain and body were being pushed out of sync with the stimuli of modern times. 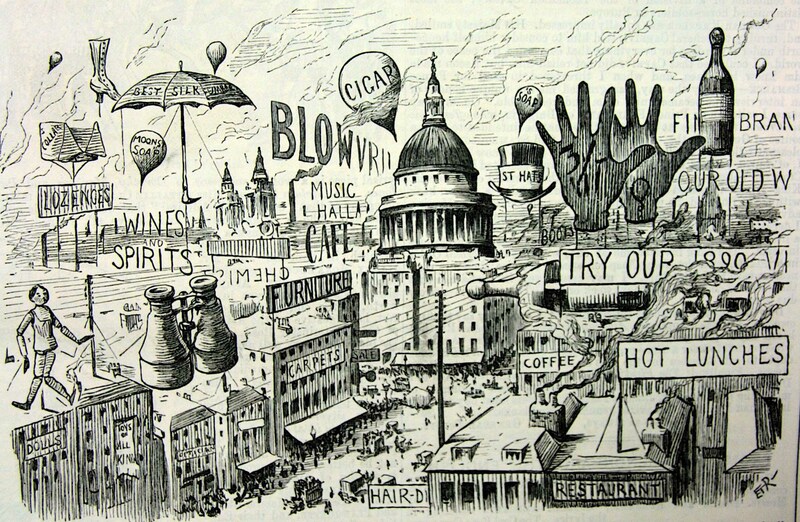 There were even diseases in the Victorian era explicitly attributed to the busyness of life. The American neurologist George Beard, for example, famously wrote about neurasthenia, a form of nervous weakness, a fatigue that he claimed originated from extreme mental effort and overstimulation. This led to concentration problems, dizziness, headaches, anxiety, and sleeping problems. Beard wrote, somewhat dramatically, that to be neurasthenic was to be modern. This was especially true of young women. Dickson says it was almost a kind of fashion to suffer from such a disease, and that the wealthier members of society were said to frequently take to the seaside when life in the city became too much for them. Neurasthenia also gave rise to the development of a range of potions, many of which were often extremely alcoholic, designed to calm the nerves. The British writer H.G. Wells, as a founding father of science fiction, wrote a lovely story about this phenomenon, called ‘The New Accelerator’, which was about the inventor of an elixir intended to bring the nervous system back into sync with the pace of modern life. As you might expect in a story, this doesn’t quite go according to plan, but, Dickson says, the notion that life was moving too quickly and was too busy was deeply rooted in this cultural moment. We can learn a lot from the Victorians, says project leader Shuttleworth. She is very lauding of the British doctor Benjamin Ward Richardson who wrote books about every thinkable aspect of life in the industrial era. Nowadays, we so often think in disciplinary categories and labels, but people like Richardson studied problems from multiple disciplines and perspectives. In his book The Diseases of Modern Life, after which the research project is named, he linked the question of public health to subjects such as work, urban planning, industrialisation, and art. Richardson was actively opposed to air pollution, and the exploitation of workers in nineteenth-century factors. He said that green cities where people might relax in parks were necessary, which tells you how ahead of his time he was, says Shuttleworth, who is pleading for a holistic approach like that of Richardson to be applied in our own time. She also thinks it’s striking how seriously the wealthy took the concept of burnout in the nineteenth century. ‘It was generally accepted that if you were stressed, you had to travel to a seaside resort in France for several months’, says Shuttleworth, but ‘now people with burnout are dismissed as being weak. Maybe we have to really consider how the Victorians coped with that’. But most of all, the researcher hopes that her project will lead to an awareness that the problems we face in the digital age are not as unique as people think. Shuttleworth says, ‘Don’t be too anxious’. In the Victorian era, there was also much attention paid to stressed children. Around 1860, the British government decided to finance schools in a new way. The wages of teachers became dependent on exam results in a school system that was already infamous for being repressive. There was now even more pressure on the students and the teachers to perform. The British doctor Sir James Crichton Browne wrote an essay in 1883 in which he voiced his concerns: ‘The pressure on the children is too great. They become over-pressured and they experience exam stress’. The writer Charles Kingsley had referred to this in his children’s book The Water Babies in 1862. In one scene, Tom the chimney sweep visits an island where all the children have been transformed into turnips. They have giant heads which threaten to explode from studying so much and never being allowed to play. Historian Sally Shuttleworth notes the parallel to the present time: ‘We too are worried about our youngsters and the great pressure they experience to perform at school’. Shuttleworth discovers that the Victorians did everything they could in their time to reform the school system. In Britain, in the 1880s, a petition was launched and signed by politicians, doctors, teachers, writers, and influential people from the business world. We have to change our education system, our children need peace and quiet, they said, and so it happened. Our thanks for this translation, which was provided by Brecht De Man, a PhD candidate at QMUL working on the perception and semantics of sound. This is a guest post by Dr Douglas Small, a Wellcome Trust Research Fellow in Literature and Medicine at the University of Glasgow and the author of ‘Sherlock Holmes and Cocaine: A 7% Solution for Modern Professionalism’ (English Literature in Transition, 58.3, 2015), and ‘Masters of Healing: Cocaine and the Ideal of the Victorian Medical Man’ (Journal of Victorian Culture, 21.1, 2016). Dr Small is currently preparing a monograph on the cultural history of cocaine in the late nineteenth and early twentieth centuries. Nowadays, we tend to be most familiar with cocaine through narratives of addiction and criminality. The destructive excess of Scarface’s Tony Montana, Nancy Reagan’s earnest plea for young America to ‘Just Say No’, and the National Crime Agency’s recent ‘Every Line Counts’ campaign define modern conceptions of the drug. 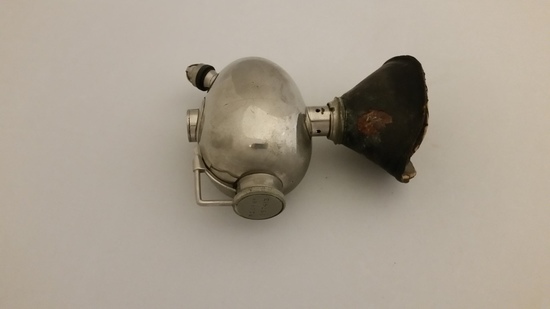 It was in the late Victorian period, however, that cocaine first came to widespread public attention, and at the time it was understood predominantly as a triumph of modern surgical technology: the world’s first practical local anaesthetic. Albert Niemann had isolated the cocaine alkaloid from raw coca leaves as early as 1860, but it was only in 1884 that the Viennese Ophthalmologist (and friend of a young Sigmund Freud) Carl Koller discovered that a mild solution of the drug would, if introduced into the eye, deaden the nerves’ sensitivity to pain. Koller was too poor to afford the trip to the Heidelberg Ophthalmological Society’s annual conference himself, so he had to ask his friend Dr Joseph Brettauer to announce the discovery on his behalf. Koller might not have been present to witness his colleagues’ reactions first hand, but the result was that both he and cocaine were to become two of the premier medical celebrities of the age. Cocaine’s miraculous character was in large part sustained by how favourably it compared with existing general anaesthetics. Unlike chloroform and ether, which stupefied recipients, cocaine seemed to eliminate pain with a simple touch or hypodermic injection, and without any loss of consciousness. Chloroform had been widely-used as an anaesthetic for almost forty years by the time cocaine reached its ascendancy, but the danger of anaesthetic death remained a constant concern in the minds of surgeons and patients alike. Dr J McNamara penned a somewhat melodramatic letter on the subject to the British Medical Journal in October 1894. 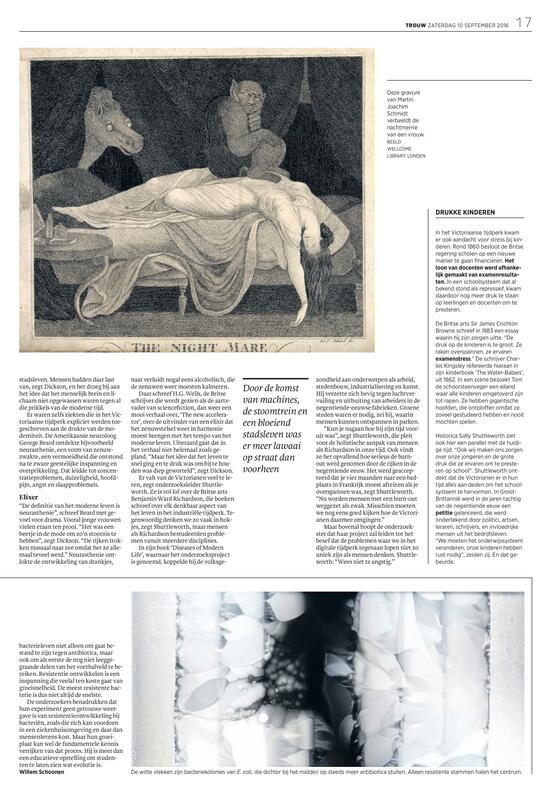 McNamara’s letter began: ‘The records of death by chloroform are monstrous in their frequency.’ And ended: ‘Is it not time to discard the lethal chloroform, and thus put an end to the human sacrifice that is weekly offered on [its] alter?’ If Doctors were cautious of general anaesthesia, then patients were often even more so. Until the end of the century, it was not unusual for doctors to encounter patients who were so intensely afraid of chloroform that they would simply refuse to take it. ‘In an age when a surfeit of new discoveries seems to have bred the familiarity which produces contempt, it is refreshing to draw attention to a discovery which has surpassed the ordinary standard of greatness sufficiently to enable it to figure as a wonder of the age. Cocaine has flashed like a meteor before the eyes of the medical world’. In contrast with older anaesthetics, cocaine seemed haloed, ‘like a meteor,’ with the celestial light of modern efficiency. 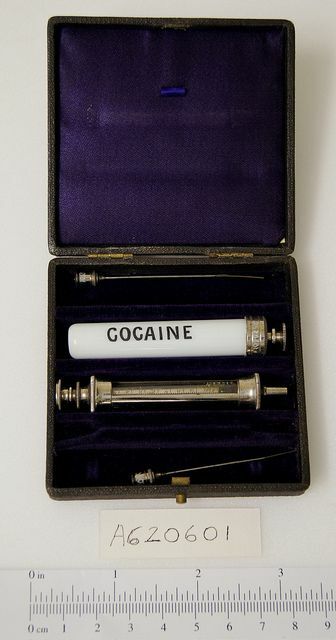 For the last decades of the nineteenth century, cocaine offered the promise of a new age of medical innovation, an era in which pain could be conquered, surgery effortlessly undertaken, and morality immaculately preserved. On 10th and 11th September, the Diseases of Modern Life team held its main conference, ‘Medicine and Modernity in the Long Nineteenth Century’ at St Anne’s College, Oxford. Over the weekend, we explored phenomena of stress, overload, overpressure, and other disorders associated with the problems of modernity in the nineteenth century. Discussion, both online and offline, was extremely rich and we had over three hundred conference tweets throughout the two days. A storify summary of the event is available here. One delegate remarked during a coffee break that he had at first been uncertain about the parameters of our conference, as in many ways our call for papers might apply equally to the nineteenth century and to the twenty-first. And this was certainly a frequent refrain in many of our panels. As parallels were continually drawn to present day stresses and strains, questions were raised about how much has in fact changed and what we might learn from our studies of the past. Many of our speakers responded to this challenge by tracing productive discussions across the fields of literature, science, and medicine, or by providing rich comparative perspectives from international viewpoints, drawing on sources from Finland to France, Germany, America, Japan, India, South Africa, and the South Pacific to reveal connections between physiological, psychological and social health, or disease. What emerged through this work was a far more integrative and holistic approach to notions of disease, one that disrupted the frequent compartmentalization of psychiatric, environmental, emotional, and literary histories in present practice in order to offer new ways of contextualising the problems of modernity. Over the coming weeks, we will be featuring a selection of our speakers’ papers in the form of blog posts on the website, in order to continue the rich discussions started at the conference. We hope you enjoy them.